Sail away with us on our 60-feet luxury catamaran to the east part of Curacao. A beautiful trip full of diversity! The BLUE C will depart from Blue Bay Beach, after boarding we will head east. During this time guest will be able to enjoy the beauty that Curacao has to offer along the coastlines. 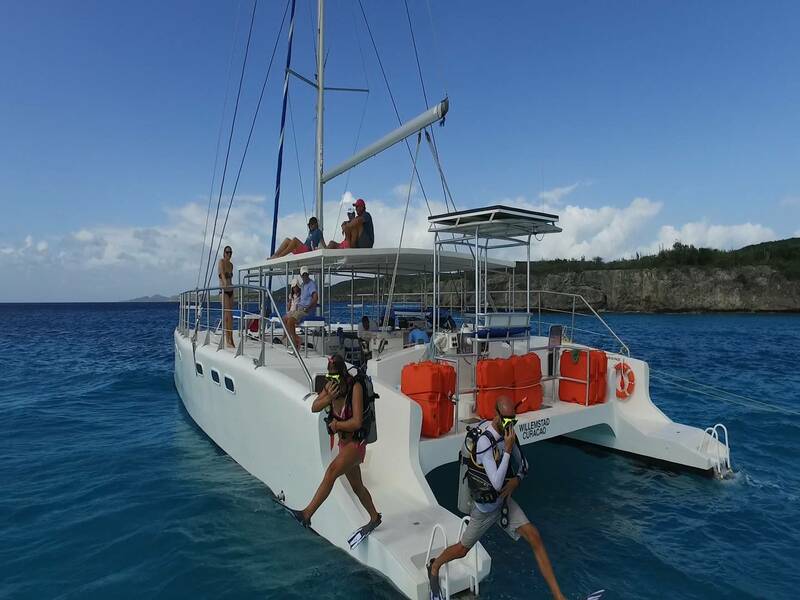 The Blue C Watersport comfortably takes you to Curacao's best places where you can swim, snorkel, scuba dive or just relax with friends and family. Our first stop will be at Curacao's most famous snorkel site "Tugboat". 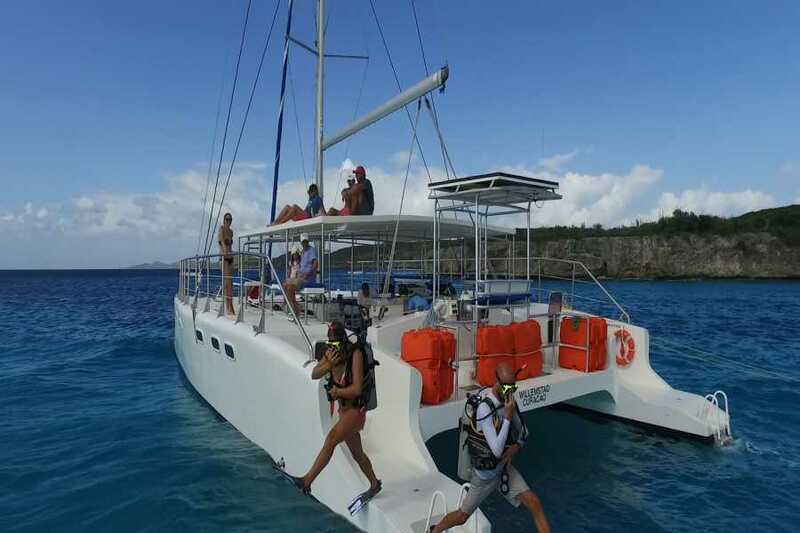 Here, a guided snorkel tour lead by one of our professional crew members will take place. Don't have a snorkel set? Don't worry! Regular snorkel sets including fins are free to use the whole day! Scuba Divers have the option to dive on the renowned dive site. After discovering the pleasures underneath the crystal blue seas, we will head to an unspoiled place where lunch will be served; a live cooking BBQ buffet to satisfy the even hungriest traveler. In the afternoon will we have several stops, we will snorkel at the stunning coral reef at "Long Beach" and head towards the city center, where you will have a different view of Willemstad's colorful architecture & the unique swinging bridge. On the way back there will be a Blue Curacao tasting for the people that want to try! After a relaxing day at the hidden gems of Curacao, our Blue Bay Beach staff is ready to serve you some more refreshing drinks at the Happy Hour. 1:30 PM DEPARTURE Sailing towards Willemstad & Anna Bay. While cruising along the unique scenery of the Handelskade & Floating bridge, you will enjoy some Tropical snacks and ice cold drinks! *Times are approximate and may vary due to wind and weather conditions. - Blue Curacao Liquor tasting; Try some local flavors! *Alcoholic drinks only available after lunch, combining of alcoholic drinks and snorkeling not allowed. - Scuba Diving: Limited places available (Introductory and certified dives). This must be pre-booked. - Extra Alcoholic beverages (Rum, Vodka, Tequila, Gin, Wine & of course Blue Curacao! CERTIFIED DIVERS – must possess an internationally recognized SCUBA certificate card.